12 DAYS OF A PIONEER CHRISTMAS CONTINUES. . .
Look what appeared on my doorstep today! These beauties are extra special. Much bigger than I expected with a very cool cover, complete with a gorgeous book-jacketed flap (I think I made that up) with the authors' pretty faces tucked inside. Well done, Barbour Publishing! Best part are the stories though.These books will make wonderful Christmas presents and stocking stuffers--but you'll need a super-sized stocking to hold them. ﻿﻿﻿Due to an unavoidable absence from my computer last night and most of today (there must be a universal law that states air conditioners only go out in Texas on blistering hot August weekends), I'm going to slip in a quick introduction to the book here today and continue with my author interviews first thing tomorrow. However, this post counts in the 12 Days of Christmas Giveaway, so be sure and leave a comment below. Remember, you may comment as many times as you wish throughout the contest, but only one comment per person per day will count as an entry. 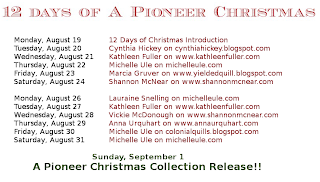 Introducing A Pioneer Christmas Collection! When Barbour Publishing announced they were looking for novellas for A Pioneer Christmas Collection, they had just a few parameters: the story needed to take place between the 1700s to the late 1800s, have a pioneer experience, and celebrate Christmas in a unique dwelling. The stories that appear in A Pioneer Christmas Collection certainly met that criterion. Ranging in time slots from Shannon McNear’s lead-off Revolutionary War story, to Michelle Ule’s final tale of the 1897 Alaskan gold rush, the novellas sweep across North American locales both familiar and little known. Shannon McNear portrays a surprising romance between a militiaman loyal to the Crown hiding after a battle in which his side lost, and a young woman patriot in charge of her siblings when her father goes to fight in Defending Truth. "People were all just struggling to live their lives, and the politics were as upsetting and confusing as today." Celebrating Christmas in the cave where her hero was hiding, seemed a terrific idea, and certainly a unique one. Kathleen Fuller has often driven past her setting for The Calling: the Unionville Tavern in northeast Ohio. “Once I found out the tavern was a stagecoach shop [in the early 19th century], I immediately came up with the idea of a traveler stopping at the tavern on a regular basis.” In The Calling, the traveler is a young man convinced he’s called to preach to those heading west, rather than the settled east. It’s the tavern keeper’s daughter who catches a vision of who he really is. How many of you have spent Christmas in a tavern? Several writers deliberately sought often over-looked times and places. Anna Urquhart had seldom heard of pioneers traveling by water and examined the opening of the Erie Canal in 1830’s which led to settlements in Michigan Territory. A Silent Night actually begins in Edinburgh, Scotland and follows the challenges of making a life in the big woods of the upper Midwest. The drama of a marriage lost and found is played out over Christmas in a barn beside a smoldering cabin. A Pony Express Christmas by Margaret Brownley takes readers to a spot most of us think we know—or do we? When a vigorous young woman goes in search of her long-lost express-riding brother, she saves a man from outlaws and drives him to help her search. Set during the Civil War era, A Pony Express Christmas leads us eventually to Chimney Rock where she finds the answers she seeks—and so much more. What happened to those Pony Express stopping stations and could they make an abandoned spot a holiday site? A Christmas Castle by Cynthia Hickey features a mail order bride who arrives in post-Civil War Arizona to discover her intended dead and a small child needing a mother. With outlaws trying to run her off her “inheritance,” she struggles with the help of a handsome neighbor to keep her land. Somehow she’s able to fashion a Christmas celebration in a virtual hole in the ground. Who knew it could snow in Arizona in the winter? Have you ever had to cram a too-big Christmas tree into a too-small room? 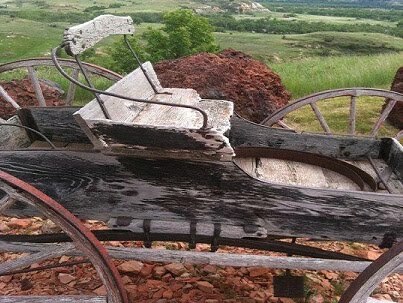 Lauraine Snelling returns to an area familiar to her readers in The Cowboy’s Angel, set in 1875 Dakota Territory. With her long-overdue husband miles away seeking supplies, a pregnant woman is forced to give birth with a stranger in attendance. Snow socked them into a half-built claim with the farm animals a thin wall away. Using meager resources in a rough home, a woman finds cause to be thankful. How often have you had to “make do” for Christmas? Marcia Gruver takes us to sophisticated 1885 New York City in A Badlands Christmas, though we don’t stay there long. Inspired by the adventures of Theodore Roosevelt in the town of Medora, A Badlands Christmas shows the contrasts between festive scenes in the city and a Christmas spent in a dilapidated sod house in the middle of a brutal Dakota Territory winter. While you may have dealt with the weather outside being frightful on December 25, did you ever live half under the ground? Buckskin Bride by Vickie McDonough introduces us to a capable but desperate young woman who is more comfortable in buckskin than calico. She and her sisters are squatters on land the hero won in the 1889 Oklahoma land run. The handsome Irish landowner is kind but dare she trust him when her father warned her to avoid all men? With Christmas approaching, her father missing, and young sister injured, will she and her sisters spend Christmas alone in their tipi? Have you ever spent Christmas in a tent? In The Gold Rush Christmas, Michelle Ule takes brother-sister twins and the boy-next-door to 1897 Skagway, Alaska where they meant to enjoy the season in the newly-constructed Union Church. Searching for a missionary father, however, lands them in a Tlingit cedar long house for a lesson in how to present the gospel in a way anyone could understand. Who can beat salmon for Christmas dinner, even if eaten off a plank? Interested in Christmas spent in novel ways, surprising settings, heroes and heroines filled with love and pluck? Why not try the nine stories found in A Pioneer Christmas Collection? A Pioneer Christmas Collection Giveaway! Comment below to enter. Every day that you leave a comment is a new entry. At the end of our 12 Days of Christmas Promotion, two winners will be chosen at random. First prize is a $50 gift certificate from Amazon.com. 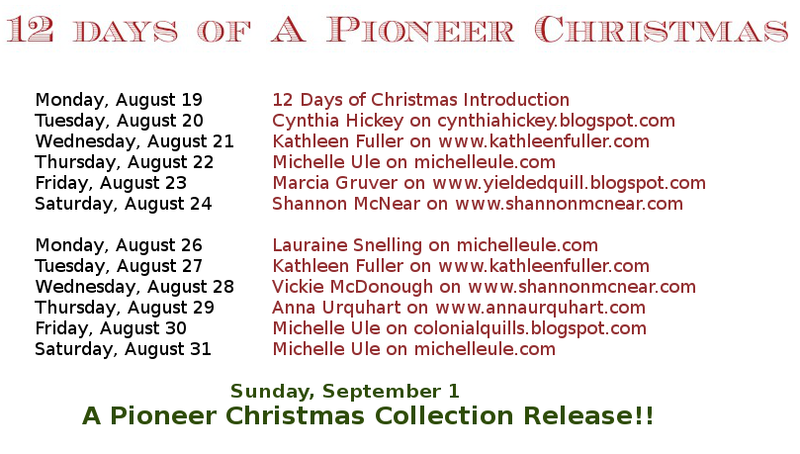 The second prize (but best in my opinion) is an autographed copy of A Pioneer Christmas Collection signed by all 9 Authors! Each day you have a new opportunity to enter! You may comment all you like, but only one entry per day will be counted. These stores are so good, Gail. I think you'll love this book. I love novella collections, especially Christmas ones! I so can't wait to pick this one up! Thanks for entering me in the giveaway for the book, "Twelve Days of Christmas". I love them, too, Heidi. Maybe you'll win at least one copy, but remember they'll make great Christmas gifts. Good luck!